Acurlite Structural Skylights, Inc. is proud to have been involved in creating a new home for the North American Division of The Seventh’s Day Adventist Church. This project converted a 116,600-square-foot office building in Columbia, Maryland, into a modern facility that serves 1.2 million members across the United States. The North American Division is establishing it’s own identity and location apart from the church’s global headquarters. The renovation of the four-story building is intended to help them more effectively facilitate it’s message to a broad and diverse community, which includes more than 6,000 churches, 40 hospitals, 14 universities and hundreds of schools in North America. The facility includes a modernized infrastructure for multiple departments and more than 100 employees. A previous open atrium with trees and grass is now replaced by a new sky-lit atrium common that serves as the heart of the facility. The geometry is a custom single pitch skylight with large bays of glass that gives an open air feel. 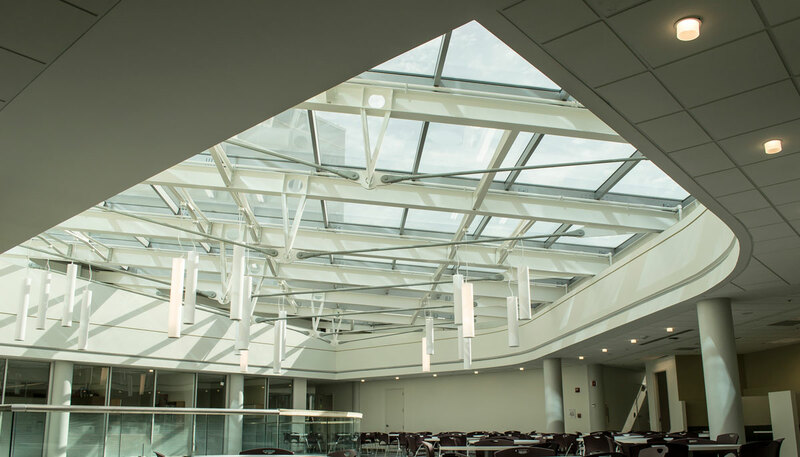 The sun from the skylight lights up the facility for those inside to better enjoy the space. Acurlite was also responsible for interior metal cladding work that gave the skylight and space a seamless finished look. As with any renovation the project had its own set of challenges that needed to be overcome. Acurlite’s experienced design team was able to assist with many of these project challenges along the way. This included custom connections and custom closures to make the renovation successful. 1-7/16” I.G.U. – VNE1-63 H.S.